EDMONTON - The election writ is set to drop this week in Alberta and if the demonizing hyperbole from the two rightist heavyweight parties is to be believed, voters have a simple choice: Mommie Dearest or Psycho. 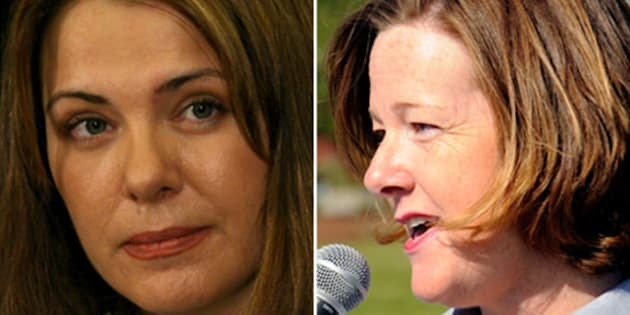 The governing Progressive Conservatives and the upstart Wildrose party are running one-two in the polls as Premier Alison Redford prepares to call the campaign shortly after her caucus passes the budget on Wednesday. "I think people are pretty anxious to get to the polls as am I," Redford said. "I believe we're going to have a strong election. We're going to have a strong showing." Redford is running in her first election as premier since taking over as party leader from Ed Stelmach last fall. History is on her side. The Tories have been in power for more than 40 years with 11 consecutive majority governments, alternating between solid and crushing victories. They have decimated all comers from the left side of the spectrum, but this time face one coming at them from the right. The Wildrose party, under leader Danielle Smith, has become a threat to the Tories by co-opting the traditional conservative agenda of balanced budgets and reduced spending abandoned by the Tories under Stelmach and Redford. They have capitalized on public discontent with recent land laws, some of which since rescinded, that gave cabinet sweeping power to grab private land and cancel leases to build infrastructure. But some of the Wildrose's most dangerous weapons were handed to them. Redford's team has been left reeling in recent weeks by a string of troubling and embarrassing revelations. Leading the pack is the announcement by the Canadian Taxpayers Federation that one in four legislature politicians, most of them Tories, have been cashing in to the tune of $1,000 a month to sit on a committee that doesn't meet. Redford is also dealing with the fallout from suspending Asian trade representative, and Tory party darling, Gary Mar pending an investigation into alleged influence peddling. Meanwhile, there are 10 Tory ridings being investigated for donation violations. And a panel of doctors, in a scathing report, says the government bungled health care so badly in recent years it led to widespread suffering among patients and systematic intimidation of physicians who complained about it. The head of the Alberta Urban Municipalities Association says grant money is too often dispensed based not on need but on who is loyal to the PCs. And Tory backbencher Hec Goudreau was recently demoted for threatening officials in his own riding to stop criticizing the government or risk losing a new school. The Wildrose have made PC corruption the focus of their campaign, complete with a stop sign logo and announcements of malfeasance tagged like courtroom exhibits. "A pronounced culture of corruption, cronyism, intimidation, bullying, self-dealing and patronage has taken hold inside the PC government," said Smith at the campaign kick-off. "Our job over the next few weeks will be to show Albertans the full extent of this culture and leave it to them to decide whether or not the PCs deserve another shot." Redford told a radio call-in show last week that her government has an image problem. "We are seeing some things right now that I think are illustrating what have been, in the past couple of years, problematic," she said. "It's not right and I don't agree with it, either." Redford herself has been on the hot seat, criticized as a jelly-spined promise-breaker. She promised a fixed election date but instead — reportedly after push-back from caucus — passed a law giving her room to call the election in a three-month spring window. She promised a public inquiry into the doctor bullying — an issue that threatened to reach into the high offices of her government — only to change tack and restrict it to queue-jumping. When critics howled, she pointed to a statement she made last year that focused only on queue-jumping. The tenor of the election has already broken with tradition. The Tories have rarely resorted to attack ads on opponents, given poll numbers that allowed the luxury of the high road. The Tories have already launched radio attack ads in what is expected to be the key battleground of Calgary, warning voters that Smith — blinkered by ideology and demagoguery — is sociopathically fighting to have people killed by drinking drivers. The ads revolve around a new law passed by Redford and to be implemented this year that penalizes not only drunk drivers, but those who are close to being drunk behind the wheel. The Wildrose has made gains campaigning that the law grants police unchecked roadside power to seize vehicles and suspend licences for social drinkers who haven't broken the law. The Tory ads urge Smith to give her head a shake. "Danielle Smith says the new rules could ensnare (light-drinking) couples on a date night?" it says. "Let's tell the Wildrose that real leadership is about making decisions to save lives. "Danielle Smith and the Wildrose: not worth the risk." The Wildrose has responded in kind, leveraging the issue to paint Redford as a Mommie Dearest figure — the nanny-stater who bullies her people or lovingly smothers them with rules and regulations. On paper it's not a fair fight. The Wildrose have four seats in the legislature, three of them Tory floor-crossers, compared with 67 for the government. But with recent polls suggesting the popularity gap has closed, Redford told reporters Friday she's ready to go to the doorsteps with a new fiscal stringency plan of zero-based budgeting along with plans to build more schools, add long-term care beds, boost oilsands monitoring, and reduce wait times in hospitals. "I'm excited about our budget, and I'm also excited about the fact that we're articulating a positive and hopeful and a concrete plan," she said. "I think that's a pretty big differentiation (from the Wildrose)."